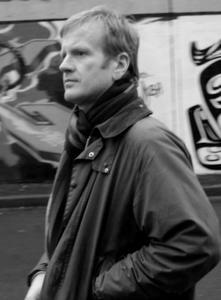 Colin Marshall sits down above Gastown, Vancouver, British Columbia with novelist Timothy Taylor, author of Stanley Park, Story House, and The Blue Light Project, as well as the short story collection Silent Cruise. They discuss what, exactly, Vancouver is; what, exactly, CanLit is; his being born into a nomadic lifestyle; his inadvertent prediction of the modern locavore movement; whether one can live in Vancouver without developing an interest in architecture; his fascination with creative and toxic “dyadic relationships,” as well as the place of emulation and envy in human affairs; how he discovered René Girard’s ideas about “mimetic desire” and came up with a critique of consumerism contra his countrywoman Naomi Klein; the visible desires of Vancouver and its murky, independent-minded past; our quasi-sacrificial system of celebrity; what he learned from watching reaction videos on YouTube; his moves from the navy to banking to consulting to writing; how he grew fascinated with entrepreneurs; why we haven’t eaten so well, historically, in North America; Canada’s potential as the New-Worldiest place in the New World; his search for where people gather when he visits a new city, and where he would say Vancouverites go to be Vancouverites; his disputation of tradition in Canadian literature; his next project picking up on the lives of the characters from Stanley Park; and what to open yourself up to when you come to Vancouver. This was written by Colin Marshall. Posted on Sunday, June 16, 2013, at 3:46 pm. Filed under Notebook on Cities and Culture, Vancouver. Bookmark the permalink. Follow comments here with the RSS feed. Post a comment or leave a trackback.